1) Including All Toll Tax,Parking & Driver Allowance. 2) Average Per Day 300 k/m. When we are planning for a yatra from Mumbai to Ashtavinayak tour the necessary distance required for completing Ashtavinayak Yatra from Pune. Starting from Pune, start with Shree Chinaman of Theur which is 25km from Pune. Lord Brahma meditated in this place to overcome his unsteady mind.his chinta (worry) was solved the idol is called Chinaman. From Theur, go and have darshan of Shree Mayureshwar at Morgan the distance in between is 70km. Another route that leads to Moreshwar is via Pune-hadapsar-Jejuri which covers 64 kms. On the way you can have darshan of Lord Khandoba of Jejuri. From Moregaon, Shree Siddhivinayak of Siddhatek at a distance of 65km via supa-patas-daund-Siddhatek. On receiving blessing from Lord Shree Ganesh, Lord Vishnu destroyed two demons Madhu and kaitabh. 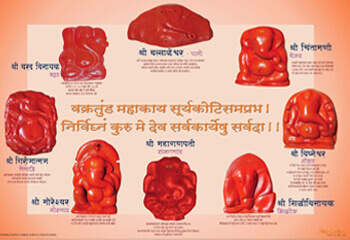 It is believed that Siddhivinayak leads work to the culmination. Shree Siddhivinayak is supposed to be jag rut place of shree Ganesh. Then from Siddhatek, Shri Mahaganpati of Ranjangaon-Distance required is 92 km. Ranjangaon is situated on Pune-Ahmednagar main road. Arriving from Siddhatek to ranjangaon you will come across a Sugar factory named Srigonda. After completing these 4 Ganpati’s we halt at some place to take rest and continue the yatra next fresh day. There are staying arrangements made for the tourists according to their requirement. Next day starting from Ranjangaon, go to shree Vighneshwar at ozar the distance is 100km via Shikrapur-Chakan-Rajgurunagar-manchar-narayangaon-ozar Shree vighneshwar who is removal of obstacle, he has defeated demon Vighnasur. He gives happiness to his devotee, who domicile at ozar. This is the only temple with a golden dome. From Ozar, Shree Girijamaj of Lenyadri which is 15 km far via Our the only place situated on a mountain and in the neighbourhood of the Buddhist caves. In Ganesh Purana this place was called as ‘ Jeernapur’. River Kukadi flows between Gunnar and golegaon. From Lenyadri, go to Shree Varadvinayak at Mahad it has a distance of 111km. Varaddvinayak is located in khalapur taluka of raigad district. In this temple, one lamp is alighten for last 107 . From Mahad, Shree Ballaleshwar at Pali at a space of 111km. It is said that in Peshva regime justice was done by taking kaul from Ballaleshwar. From Pali back to Pune. You can check Ashtavinayak tour package from Mumbai on our website where you will get the details of rates and all other queries.